Workers World Party’s conference comes at a critical juncture in the world movement against capitalism and imperialism. The only solution for the suffering and exploited masses of working and oppressed people is socialism. Our organizational and ideological efforts could determine our position in this emerging phase of the class struggle domestically and internationally. In discussing our work in Michigan, it is essential to review the case of political prisoner Rev. Edward Pinkney. 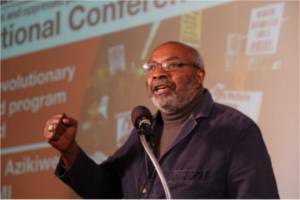 He is a longtime fighter in the southwest region of Michigan, where restructuring of capitalist production rendered cities, such as Benton Harbor, to extreme poverty and exploitation. Through the Black Autonomy Network Community Organization, he and his followers have waged a monumental campaign against the Berrien County Courts’ racist impunity, imposition of emergency management and gentrification of public areas and communities in capital’s interests. In December, we held a National Organizing Conference to Save Rev. Pinkney; participants came from several states. The gathering pledged to intensify efforts to prevent threats to his life. Due to our work, Rev. Pinkney was transferred from Marquette Branch Prison to a prison in Muskegon Heights, much closer to his family and supporters. Rev. Pinkney’s plight reflects the racist nature of Michigan’s justice system. Courts denied his motions for bond pending the outcome of the appeals process and other legal efforts. This illustrates that legal methods cannot be relied on to free our fighters or win justice for the working class and the nationally oppressed. Nonetheless, resistance is developing inside the prisons in Michigan and across the U.S. A national prisoners’ strike was held in September. The level of consciousness among the imprisoned nation, as Mumia Abu-Jamal refers to it, is reaching new heights. The situation in the prisons represents heightened repression of the masses by the capitalist system, which has exhausted hope for a decent, productive life for growing numbers of people. The Moratorium NOW! Coalition and ­the Michigan Emergency Committee Against War & Injustice appealed to the United Nations Commission for Human Rights two-and-a-half years ago at the height of the illegally imposed emergency management and forced bankruptcy in Detroit. This report noted: “Resources which should be utilized to keep people in their homes who have been subjected to predatory lending” and “payment of restitution and reparations to communities … disproportionately affected by [unscrupulous banks’] actions have not taken place.” In Michigan “over $500 million allocated through the so-called ‘hardest hit’ program to assist distressed homeowners have not been utilized to prevent mortgage or tax foreclosures.” These funds are being used “to identify homes to be torn down; many of these houses and small business were abandoned as a direct result of the [banks’] predatory actions. A Detroit Land Bank Authority (DLBA) … is seizing thousands of homes and vacant lots” without consulting residents of Detroit’s affected neighborhoods. We told the UNCHR that an appeal to U.S. Attorney General Eric Holder in 2013 by elected officials requesting the federal government intervene on the denial of voting and due process rights, as protected under the 14th and 15th Amendments and the Civil Rights and Voting Rights laws, has gone unanswered. In light of these attacks on the people of Detroit and in Michigan, the Democratic Party had the audacity to campaign among the masses, requesting they vote en masse for their presidential and vice presidential candidates. Based on their own experiences, the people know that there are no fundamental differences between the Democratic and Republican parties. We need a party of the working class and the oppressed that can speak in its own name and organize for the overthrow of the racist capitalist and imperialist system — for the realization of national liberation and socialism. For two years our coalition has waged a monumental struggle against massive tax foreclosures and water shut-offs. We have forced the Wayne County treasurer to enact moratoriums on property tax foreclosures resulting from banks’ predatory actions. Tens of thousands of people have been allowed to make payment arrangements on these illegal tax assessments. Based on our efforts, the Michigan American Civil Liberties Union, NAACP Legal Defense Fund and other entities filed a class-action lawsuit aimed at winning a moratorium on property tax foreclosures, which violate the 1968 Fair Housing Act. We demand that the hundreds of millions of dollars in federal funds be used for their intended purpose — to keep people in their homes through payments of delinquent property taxes and inflated water bills. We forced an upcoming meeting with the Michigan State Housing Development Authority, demanding they rewrite the regulations for allocating funds in Detroit and Wayne County for these purposes. The DLBA’s and Mayor Duggan’s city administration corruption is now clear for all to see. We will continue to build a revolutionary response to national oppression and rapacious capitalism at the March 25, 2017, Party conference in Detroit. Next year marks the 50th anniversary of the heroic African-American working-class rebellion in Detroit. It is imperative that the actual history of these important struggles be told from the people’s ­perspective.